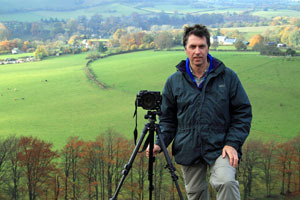 My name is Chris Lock and I'm a landscape photographer based in South Wiltshire. the ever-changing colours and moods of the Wiltshire and Dorset landscape are my constant source of inspiration. The enjoyment gained from taking photographs, from trying to capture the light and colours at their best, is matched by the experience of simply being outdoors, wandering over the hills and through woodlands, ever thankful for the privilege of living in this beautiful part of the world. Photography has given me a far greater appreciation of our surroundings in the natural world. Every year in late April and early May I am drawn to woodlands full of bluebells, not because the photos I will take will be any better than the hundreds of bluebell photographs I have already, but because the experience of being in a bluebell wood early on a Spring morning is such a treat. Unfortunately the photographs can never capture the sound of the birds or the scent of the flowers! Apart from an A level photography course at Salisbury College, I am largely self-taught, now using a Canon EOS 5D digital SLR along with my trusty Mamiya medium-format film camera. All prints, cards and coasters produced by Wishford Arts are made from my own original photographs. My work appears regularly in Wiltshire Life magazine. I frame my own prints, usually in plainwood ash frames, although other styles are available on request, and I am available for photographic commissions.